Joyce Carol Oates turned 75 years old yesterday, and she’s now writing some of the best fiction of her career. The Accursed is the Oates novel that best displays her range, her feel for the pressures we all exert on each other. That was a beautiful piece. Yes, it feels like betrayal finally deciding to end the life of a loved companion animal. I could not do it the first time with my cat I had for 17 years and had my husband take her to the vet. Our marriage lasted as long as the cat, our relationships starting at the same time and both our Frtiz and my marriage died in the same year. The second time with my dog my daughter was with me and it was brutal, but the right thing to do. I am still grieving when thinking about it. Great post, it really resonated. My family had a feline friend sick for several months and also had to weigh the value of one more day on earth vs. one more day of suffering. Your post also made me think about what it is that makes us fall in love with our cats…and their dependency, the smallness of their world and the fact that they don’t seem to need much, but they do need a companion..it’s very affirming (since, as you said, dogs will love anyone). Mine waits for me at the door every day too. Hopefully for another decade or more. I’ve been through this several times. I don’t agree that you let your cat down. You helped her out. You were the one thing she could rely on, and you came through, easing her exit from this world. Our pets are fortunate, in a way, that we can offer them a graceful ending. In most countries, we can’t treat people as humanely. I love that phrase, I was the entirety of her universe. Well done. I’m one of those people who hates cats, but I love you, Janet, and I love your love for your cat. So sorry for your loss. Beautiful story. I have 3 cats. One of them is what I call my soul animal. We connect on a deep level. She’s 6 this year and I can’t imagine what life would be like without her. It’s hard to explain this love of an animal to those who haven’t experienced it. Your story is a perfect eulogy for the relationship between you and your cat. Thanks for sharing. 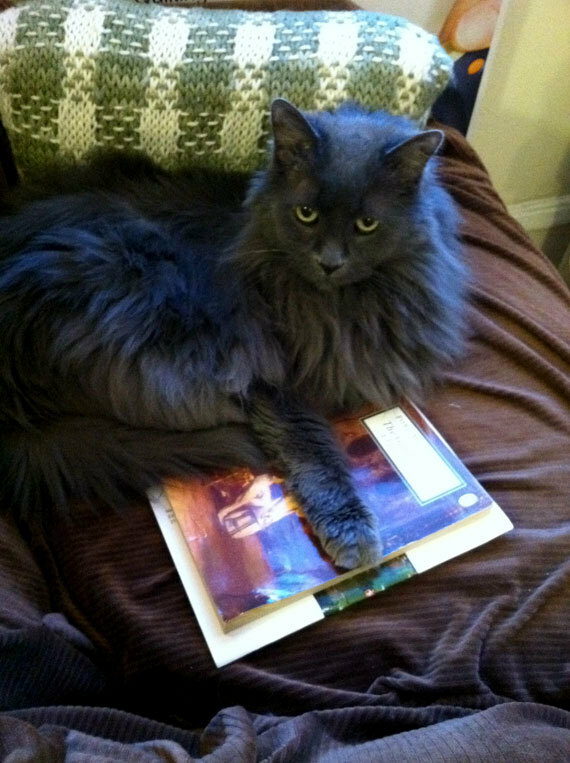 Lovely piece…just wanted to say that I’ve been there, too (and with a gray cat). Lovely, and rang so true. I had a similar experience two years ago. Still feel the guilt, and still searching for that same bond. “Smokey” was probably a Russian Blue. After Dad’s death she was all the daily companionship Mom had. When the house finally sold we moved them both in with us – about 150 miles north of their Long Island home. Smokey yowled her way through all those miles. I swear she was both expressing her extreme upset at the carrier and motion as well as keening on Mom’s behalf and on mine. Smokey lasted almost a year in her new home; long enough for Mom to awaken from her own grief. After the vet put Smokey down, wrapped in her favorite rug and in my arms it was I who keened all the way home. These creatures are not pets. They are companion animals. We are graced by their presence. Your article brought all this back. It is a blessing. There are not enough elegies for cats. And no, that’s not a snarky comment. I really enjoyed this, especially as a nerdy lady with aging cats. Hester’s death in “The Subtle Knife,” the second His Dark Materials volume, will both console and undo you. It doesn’t sound as though you gave up on Zoe, though; on the contrary, you did the best thing for her. It’s our one last act of kindness toward our pet. This ability to easily aggregate others’ content has allowed Tumblr to earn the distinction of being one of today’s hippest (and most valuable) Internet properties. That said, we should recall that Tumblr is not the first technology to engage in this practice. Consider the early-modern European analogue to Tumblr: the commonplace book.